Normally Open (N.O.) secondary EOS (end-of-stroke) switch. 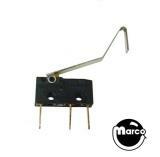 Universal snap action submicroswitch with 4 inch wire actuator that can be formed to various shapes.